Chancellor Randy Woodson and his wife, Susan, face the crowd while being introduced during a timeout in a football game. to the Wolfpack community that has been so good to us. 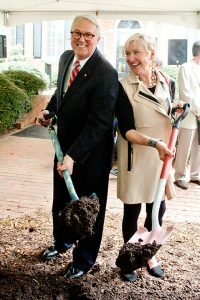 The Woodsons at the groundbreaking ceremony for the renovation and expansion of the Gregg Museum of Art & Design. For more information about the NC State Employee Dependent’s Tuition Scholarship, and to learn more about other available scholarships, please visit the Office of Scholarships and Financial Aid.